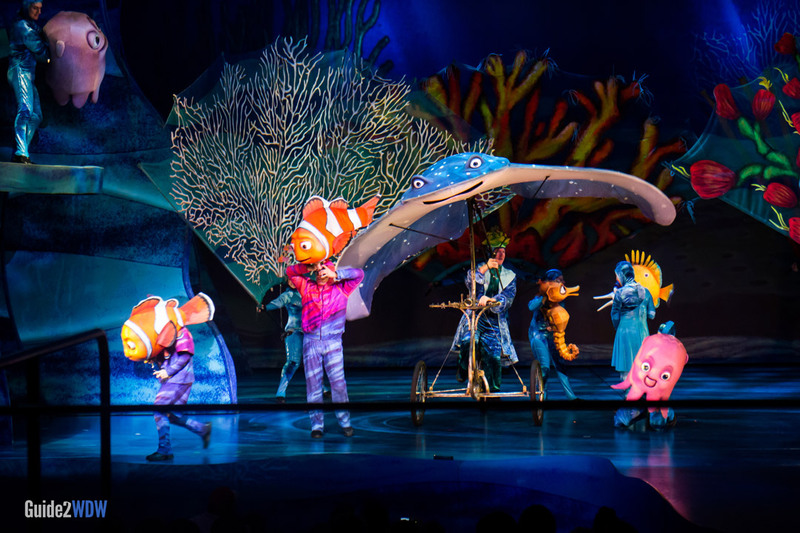 Pixar's Finding Nemo becomes Walt Disney World's best live show at Animal Kingdom's Theatre in the Wild. 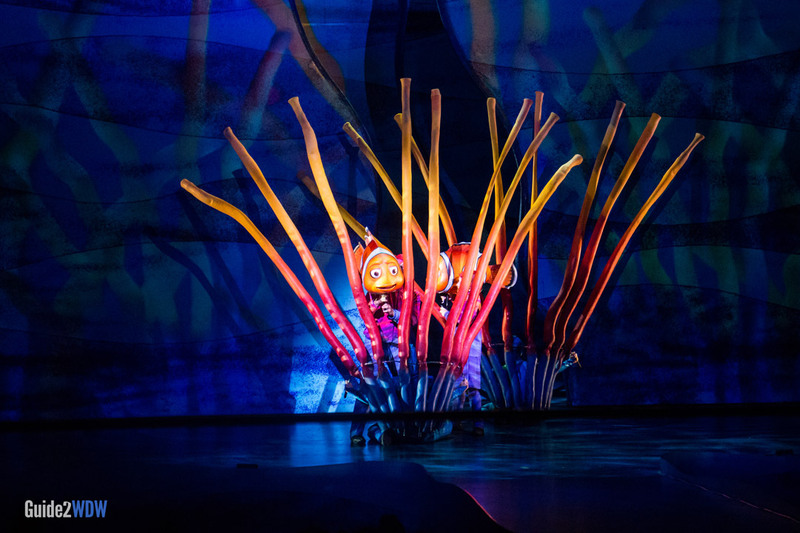 At Animal Kingdom’s Theatre In The Wild, this musical stage show brings to life an abridged version of Pixar’s hit movie Finding Nemo. Join Nemo, Marlin, Dori and all your favorite characters as they perform original music created especially for this show by Tony Award winning composer of Avenue Q and Book of Mormon Robert Lopez and his wife Kristen Anderson-Lopez. Don’t worry parents, the songs are all expectedly G-rated (unlike Avenue Q and Book of Mormon). In fact, you and your kids are probably already be familiar with the Lopez duo’s work from their original songs in Disney’s 2013 smash success Frozen or the 2011 film Winnie the Pooh. 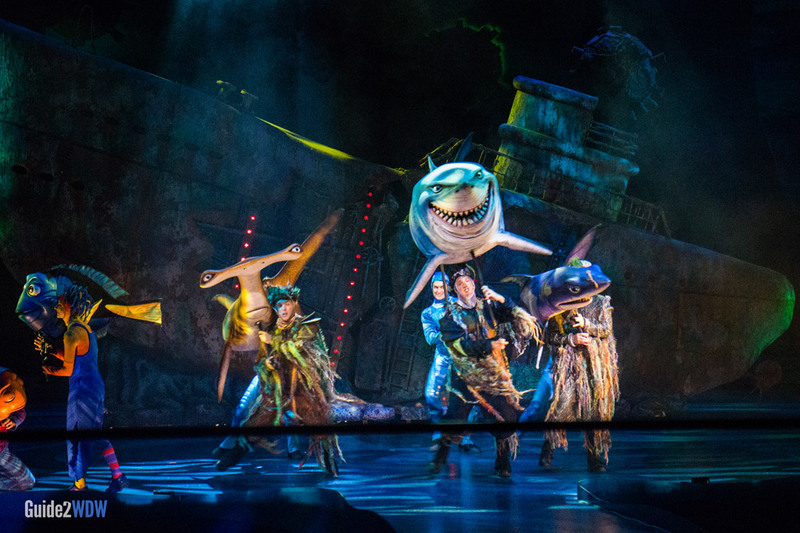 The songs in Finding Nemo – The Musical are equally full of charm and heart. Don’t be surprised if you find yourself humming “Big Blue World” or “Just Keep Swimming” as you walk around Animal Kingdom for the rest of the day. The production values are great and the performances are always strong. 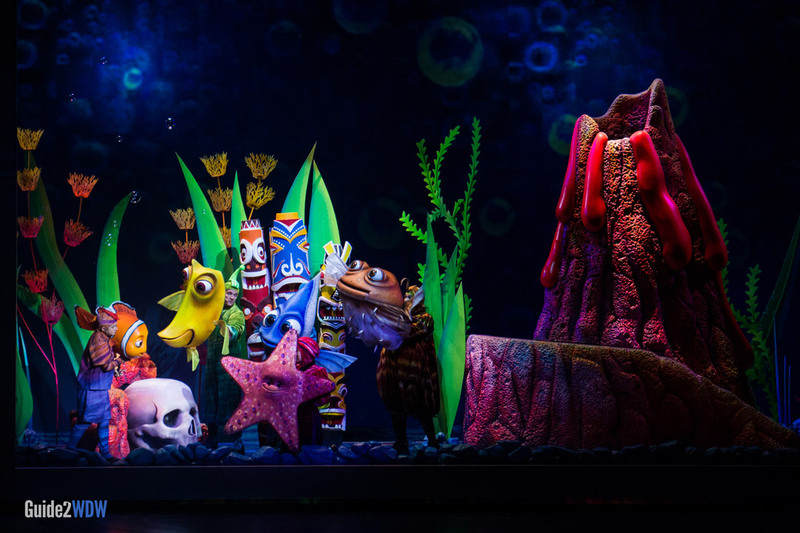 The puppets in this production are amazing, and you really get the sense of being whisked away to another world.Finding Nemo – The Musical is by far the most compelling live show at Walt Disney World. When using Fastpass+, be sure to show up at the beginning of the allotted time they give you. The auditorium is opened up to guests with Fastpass+ first before letting in other guests just a few minutes later. The puppets in this show were designed by Michael Curry, the same designer responsible for the breathtaking puppets in Disney’s Broadway adaptation of The Lion King. You can purchase the soundtrack for Finding Nemo – The Musical on iTunes. Check the Times Guide for Animal Kingdom the day you visit for specific performance times. While sitting up front will get you close to the performers, some of the best views are actually offered in the middle to back of the theatre. That way you’re able to see the entire stage, as well as all of the puppetry. This show tells the story of Finding Nemo in an abridged 40-minute version. All your favorite characters are realized with stunning puppets, including Mr. Ray. Bruce and the sharks stop the show.